Perivolia Municipal Stadium is a multi-purpose sporting arena located in the second largest city of Crete Island, Chania. First opened in 1959, the 4,000 capacity stadium was renovation in 2012 at a cost of €600,000 and is currently used for the matches of local team Platanias F.C. The municipal stadium of Perivolia first opened in 1959 and through no fault of its own, never really developed into anything more than a small provincial stadium. Traditionally home to AO Chania F.C who are one of the oldest professional teams in the nearby city, the club have spent the majority of its history in the lower echelons of Greek Football and thus there hadn’t been any need to upgrade the facilities. When Platania F.C from the local area won promotion to the Greek Superleague things changed however and the ground received over €800,000 euros worth of investment. Previously the team had played at the 1959 built municipal ground of Platanias however it was deemed more cost-effective to develop the stadium in the nearby town of Perivolia. Particularly as Platanias Municipal stadium had used an artificial playing surface since 2008, and which would be costly to replace. As Platania F.C gained promotion to the Superleague via the play-offs, the work had to be carried out in record time over the Summer however it was just about complete in time for the start of the 2012/2013 season. Upgraded included new changing rooms, press facilities and club offices amongst other facilities. If any Greek Football Trippers happen to have a stadium map or seating plan of Perivolia Municipal Stadium which we can use then please get in touch via the contact page! Perivolia Municipal Stadium is comprised of four stands: North, East, South and West. If anyone can knows where the travelling supporters sit within the stadium then please get in touch or send us a tweet. We believe it’s the southernmost section of the east stand but need confirmation. Whilst there appears to be a fan shop at the stadium we can’t seem to find any evidence of an official online store. For any questions relating to the merchandise of Platanias FC or the club shop feel free to send an email to [email protected] . Neither the Municipality of Chania or FC Platanias offer tours of Perivolia Stadium. Tickets to see FC Platanias play at Perivolia Municipal Stadium can be purchased online from the official website, from the club shop during the week or from various sales points around the ground on match days which open a few hours before kick-off. For a place in the main stand expect to pay €15.00 whereas anything behind the goal will usually set you back €10.00. 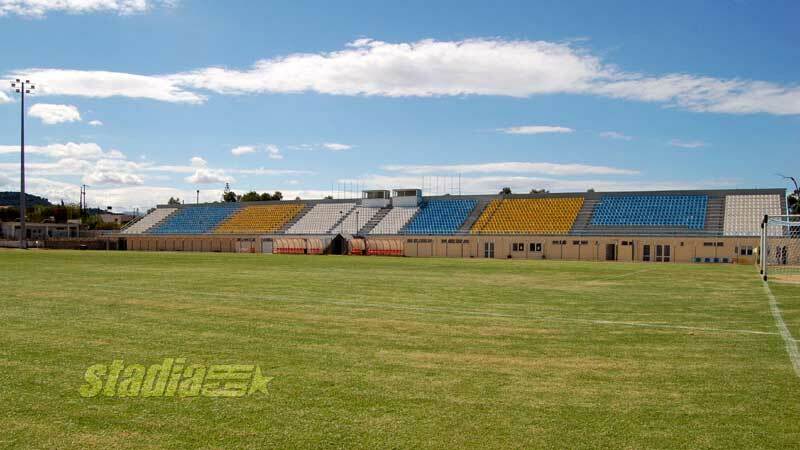 The Municipal Stadium is located 1.3 km north-west of Perivolia in a location which is easily accessible by foot within 15 minutes. As you can see by the sun screens on the cars, Greece enjoys a very warm climate. Although located out of town in an agricultural area there isn’t actually any parking available once you get to Perivolia. The village of Perivolia where the stadium is located doesn’t have its own train station as the wider Chania region and island of Crete lacks railway infrastructure. People tend to travel around the island by car. Chania International Airport is situated 18 km north-east of Perivolia close to Souda Bay. As Crete is an exceptionally popular tourist destination, Chania Airport is actually the fifth busiest in Greece in terms of passenger numbers. You won’t find any places to stay in the village as the majority of accommodation options are closer to the coast or back towards the larger city of Chania. Three moderately priced hotels you may wish to check out are: El Greco, Casa Delfino Hotel and Doge Hotel.